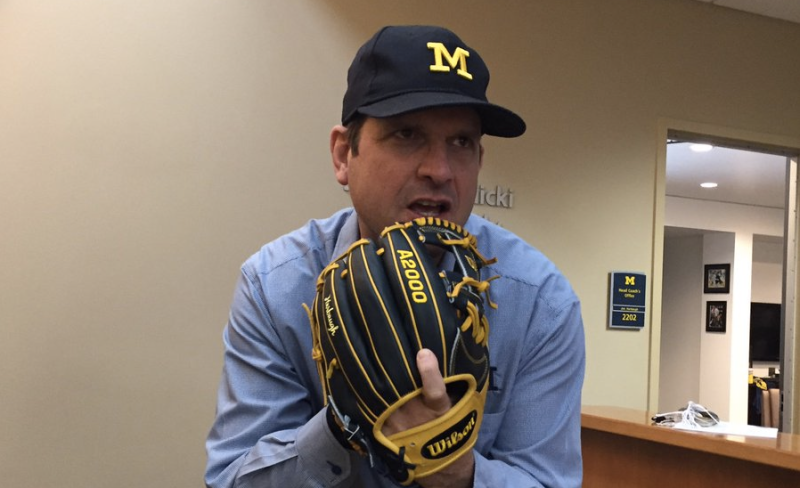 Shirts With Random Triangles: Jim Harbaugh got a baseball glove for Christmas. Jim Harbaugh and his new best friend. Image via Deadspin. It looks like Michigan head coach Jim Harbaugh got at least one of the things he wanted for Christmas. Nope, not a new pair of khakis, but a new baseball glove, courtesy of Michigan softball coach Carol Hutchins. Not a glove, but Michigan-themed one custom made for him by Wilson. One can assume that Harbaugh either went home with it for a game of catch, or... well, remember that scene in "Good Will Hunting?" Labels: Jim Harbaugh, Michigan Wolverines, That's So Harbaugh!